24HR Collision Center is British Columbia’s #1 choice for auto body repair services. 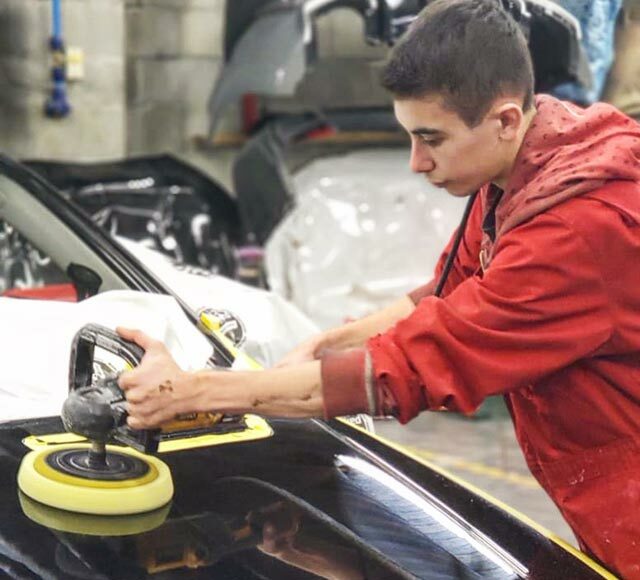 Our highly-accredited auto body technicians are collision repair specialists backed by the support of certified auto body repair shops in Vancouver and Surrey, both with advanced technology and equipment. We also help with all insurance claims, whether it’s a family insurance claim, private claim, or ICBC claim. We are an ICBC c.a.r. VALET collision repair center. In addition to collision repair, we offer many other auto body services for both minor and major vehicle damage and/or refinishing. At 24HR Collision Center, we can repair any vehicle make or model. In our state-of-the-art facilities, we offer computerized frame repair, paint matching, and free estimates. Our auto body specialists are here to make sure your vehicle looks better than ever when it leaves our shop. We provide all customers with prompt, upfront estimates and explain all necessary repairs. There are no surprises or unnecessary repairs! We’re an ICBC Accredited Valet Express auto body repair shop, which means you can bring your vehicle directly to us for a free estimate on ICBC insurance claims. We can also pick up your damaged vehicle and provide a complimentary loaner car for you to drive while your car is being repaired. Rest assured, your loaner car will be a clean, modern vehicle that you will enjoy driving while your car is being repaired to pre-accident condition. At 24HR Collison Center, we make the ICBC claim process easy and straightforward. At 24HR Collision Center, we work with all major insurance companies to ensure vehicles are repaired accurately and efficiently. Often, people don’t know they can go to any auto body shop for collision repairs, not just the shop the insurance company suggests. Our technicians will thoroughly assess the damage to your vehicle, so you get a complete, safe, and reliable repair that returns your car to pre-accident condition. Likewise, our customer service professionals will answer all your questions thoughtfully and clearly. After a car accident, 24HR Collision Center can pick up your damaged vehicle and drop off a (nice!) courtesy car right now, or whenever you need us! You can book your courtesy vehicle by sending us a request online or call (604) 327-2400 to reach either our Vancouver or Surrey location. Then, you can drive your courtesy vehicle, just as you would your own car, for the entire time it takes us to handle your collision repairs, from the initial estimate until we return your fully-repaired vehicle to you. The auto paint professionals at 24HR Collision Center are equipped with computerized color matching to perform all your auto paint needs. Maybe you’d like to conceal blemishes like few rock chips or door dings, or maybe you’re interested in a complete paint job to help your trusty older vehicle look like new. In the unfortunate event of an auto accident, auto paint may also be part of repairing damage caused to your vehicle. Whatever your situation, you can trust us to make your car look phenomenal. Collision repair is our specialty. Our certified auto body technicians will determine the full extent of your vehicle’s damage after a car accident and decide what we need to do to return it to pre-accident condition. After internal and external collision repairs are complete, your vehicle will receive professional auto body paint (baked on, just like they do in the factory) to seamlessly match any new parts with the existing body of your car. Finally, your vehicle will be cleaned, so it looks great and is in ready-to-drive condition. OEM stands for original equipment manufacturer. OEM certification means that an auto body shop has been acknowledged to use only factory-approved parts. It also means the facility has the correct equipment to install those parts and uses only factory-approved procedures. 24HR Collision Center is an OEM-certified auto body repair shop, which means you’re getting auto body repairs approved by your vehicle’s manufacturer with the convenience and personal service of a local auto body shop.